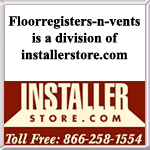 SMI Ventiliation Products plastic baseboard covers have an attractive Victorian scroll design. Made of a high-strength polymer resin, this ensures the baseboard return grilles are both durable and non-rusting. The overall faceplate size of these decorative baseboard covers will be 2 inches larger than the listed size. The depth from the wall of the baseboard return grilles vary from size to size. Please see chart below. 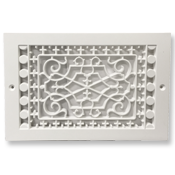 These decorative air return grilles are sold in the color white, but you can paint them to match your decor. Tip: The 14 x 6 plastic baseboard cover will fit a 14 x 6 hole opening in your wall. The decoraitve air return grille faceplate will be slightly larger, for this reason take measurements of your hole opening when placing your order. 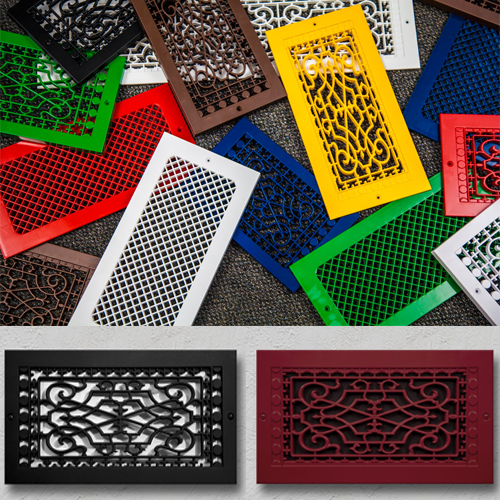 Check out our full line of rectangular baseboard return grilles including basic metal, plastic, wood and other decorative options. Purchase these no-rust plastic baseboard covers for your kitchen and bath today!